The 24th of August is National Peach Pie Day. It's been a peachy time of year thanks to the fact the August is National Peach Month - I hope you're not tired of peaches yet because today we put peach pie in a martini glass. 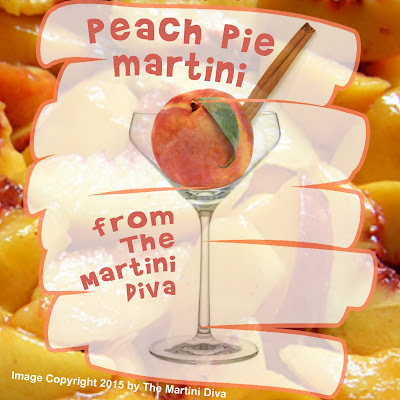 Unlike my Peach Martini (for National Eat a Peach Day on August 22nd) which was rum based, the PEACH PIE MARTINI is made with vodka. Both peach vodka and vanilla vodka combine with fresh peach juice, spices and some half & half for a little slice of peach heaven in a martini glass. For a really fun pie experience add a rim of crumbled, baked pie crust mixed with sugar as well as your fresh peach slice and you have the whole peach pie in a cocktail. It's okay to use frozen peaches if you can't get fresh and, in a pinch, you can use canned peaches, however there's nothing quite like the fresh peach for the full burst of peachy goodness.